Defense News brings us another report of the new four round surface launch system for the BAE Advanced Precision Kill Weapon System (APKWS) made by Arnold Defense of St. Louis, MO. I did a post on this system earlier, Guided Weapons Made Easy, but I had almost forgotten about it, and that would be a shame, because this may be exactly what we need give our small units both precision and a much heavier punch. APKWS is an upgrade to the long serving (and very numerous) 70 mm Hydra rocket, that adds passive laser homing. Reportedly BAE is working up to providing 20,000 APKWS kits a year. Current range for this system is about eight kilometer, probably enough for us, but there is also mention of an improved motor to extend the range. Reportedly the seeker is good for up to 14 km, so a motor upgrade might push the range out that far. The launcher seems to have similar footprint to a .50 caliber machine gun. The empty launcher weighs only 30 pounds and the individual missiles 32 pounds. If it can fit on a light land vehicle, its likely it will fit on many of the Coast Guard’s smaller patrol assets. This entry was posted in Ports Waterways and Coastal Security, PWCS, Weapons, WPB, WPC by Chuck Hill. Bookmark the permalink. We could probably team up the laser designator and the launcher on the Mk38 mod2/3. Mk38 and APKWS are both BAE systems. My original concern with mating the designator to the Mk38 would have been maximizing the missiles range in conjunction with the sighting systems field of view. As well as would a higher mast mounting prevent laser obscuration at longer ranges from wave action and spray. Also some concern of launch back blast from APKWS, it has a pretty aggressive launch/flight rocket burn. That got me thinking about Javelin. Fire and forget system.. They’ve boosted it’s range to over four and a half kilometers. And, they’ve already done all the development work on mating it to remote weapons stations. But, then you’ve got to look at costs. 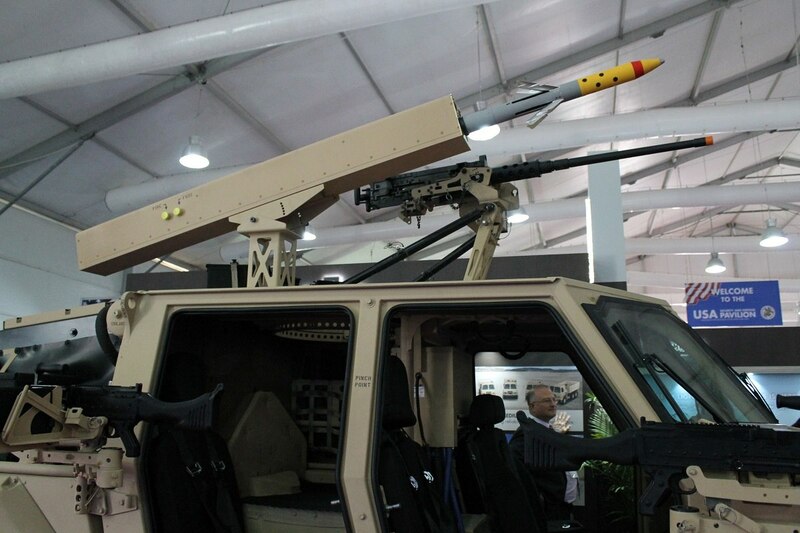 I would imagine APKWS, DAGR and the like probably have a much lower cost per round than Javelin. There’s also LOGIR (Low-Cost Guided Imaging Rocket) (Navy program) which mates a Hydra 70 to an imaging infrared seeker similar to Javelin. So, you get fire and forget capability. South Koreans have done some serious development with it, and their Marines have started fielding it in a truck mounted coastal defense role. In its Israeli “Typhoon” form the Mk38 mod2 has been equipped with Spike ER missiles in addition to the gun. This is a missile comparable to Hellfire. While a mast mounted stabilized electro-optic system with laser designator would certainly be desirable, a designator on the Mk38 would probably be useable. An elevation of 5 meters gives an 8 kM horizon distance, although that is going to be effected by sea state. In some circumstances I think a hand held laser designator might be sufficient. Really the CG needs to have a number of laser designators spread around in case we actually manage to call in assistance from other services. Getting the Air Force in particular to understand which of the many boats out their is the target (and which ones are not) can be very difficult. The Navy’s part of that contract is only $17.1million, so that’s only about 775-780 “systems.” I wonder if that is just the number of rounds, or if it is actually numbers of platforms. My guess is it’s the number of rockets. Navy has been lead on this project. This is not their first buy. The numbers are for upgrade kits, one for each rocket. There will probably be several future year contracts, so there will be large numbers of the weapons in circulation. They are certainly not going to be considered exotic. Putting some on Coast Guard Patrol boats is not going to break the bank. Yes, the Navy is the lead agency, but they are getting the fewest. You are right on many counts though: They are inexpensive for “smart” weapons; There will be lots of them; and it is but one of many buys. CG could easily get these, looking at how small, simple, and cheap they are.